Uncanny Magazine Wins the 2017 Best Semiprozine Hugo Award! The Thomases and Bolander’s Story Are World Fantasy Award Finalists and Uncanny Is a British Fantasy Award Finalist! Theodora Goss’s Rose Child Wins the Rhysling Award for Best Long Poem! More wonderful news, Space Unicorns! “Rose Child” by Theodora Goss from Uncanny Magazine Issue 13 won the SFPA 2017 Rhysling Award for Best Long Poem! Congratulations, Theodora! Alyssa Wong’s Uncanny Story Wins a Locus Award and Galen Dara’s Issue 10 Cover Wins a Chesley Award! Weightless Magazine Subscription Drive Winners! We have drawn our winners for the stupendous Uncanny Magazine Weightless Magazine Subscription Drive giveaways! Uncanny Magazine Mini-Swag Pack Winners: Steven Castaneda An International Woman of Mystery Uncanny Magazine Spiffy Prize Pack Winner: Benjamin Nash Congratulations to our winners! Your swag is on the way soon! 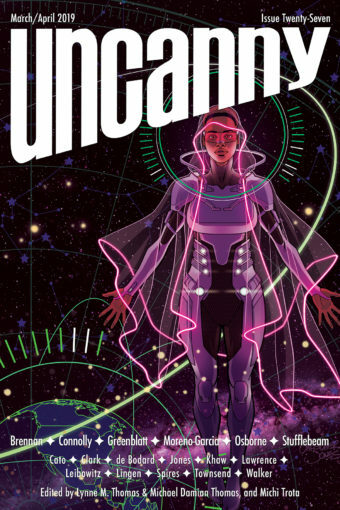 Uncanny Magazine Staff Changes: Goodbye Julia Rios, Hello Mimi Mondal and Shana DuBois!